Get the real Amsterdam feel and stay in the green heart of Amsterdam! Consume culture, shop till you drop and dance the night away in Amsterdam. Stayokay Amsterdam Vondelpark is your best starting point! 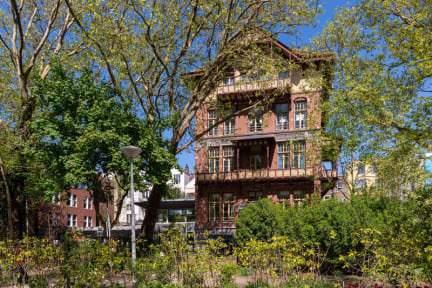 This modern Hostelling International hostel is centrally located right in the middle of the famous Vondelpark, within walking distance of the Van Gogh Museum and the Rijksmuseum. We’re at crawling distance from the Leidseplein, with its famous nightlife and clubs like Paradiso, Melkweg and Jimmy Woo! 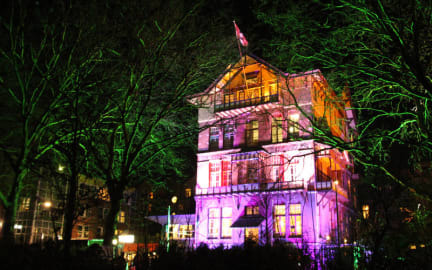 The hostel is partly located in a monumental chalet building from which you’ll have a stunning view over the Vondelpark! We have 564 beds divided over two-, four-, six- and eight-bedded rooms and some large dormitories. One room with facilities for wheelchair users (please inquire before booking). All rooms have a shower, toilet and washbasin and free individual lockers (bring your own padlock or buy one at reception). Other facilities include a game room, meeting rooms, lobby area, high-speed internet facilities, free Wi-Fi, a laundrette, bike shelter, bike rental, tourist info and discount tickets, electronic door locks, lockers and safes. Our reception is open 24/7 and there’s no curfew. Our lively bar has sports on TV and good music. Here you'll meet lots of people. We serve hearty and healthy food at great prices and we have a daily Happy Hour and the cheapest beer in town. At the reception you can buy tickets for several things to do in Amsterdam (Museums, Canal tour, Heineken Experience, Madame Tussauds) with big discounts. We have a free walking tour (daily pick-up in the hostel), a free detailed map of Amsterdam and our own bike rental. - Breakfast is not included, but you can book it separately or buy it at the hostel. Breakfast is against payment of € 7,00. - You will be given bed linen upon arrival to make your own bed. Towels are not included. These can be purchased at the hostel for € 4,50 per towel (or you can bring your own, of course). - Padlocks for the luggage lockers can be bought at the desk (or you can bring your own, of course). - Standard rooms have bunk beds. - Guests under the age of 18 must be accompanied by a parent or legal guardian. Please read our Things to Note below before booking. - Tourist tax of 7% per night of the cost of the room excluding breakfast is not included. Please pay upon arrival. Supermooie gelegenheid, erg schoon en netjes, stijlvol ingericht. Echt een aanrader! Wij hebben hier met 5 vrienden verbleven in een kamer van 20 en het is een zeer tof en proper hostel. Er is voldoende ruimte in de kamers. Kussens vond ik persoonlijk wat te plat, maar dat kan aan mij liggen, matras was zeker goed. Hippe inrichting, zeer vriendelijk personeel. Jammer dat de cocktailavond niet doorging op dinsdag zoals nochtans vermeld werd. Ontbijt ook dik in orde (er was zelfs soyamelk aanwezig), alleen vonden wij geen koffie? Uitstekend. Goede bedden, ook voor de wat langere hostelgast. Schoon, TWEE douches per kamer: top! Ook goed: aparte afvalbakken voor plastic en papier. Vriendelijk en behulpzaam personeel. Prachtige locatie. The rooms and beds were good but the checkout time was way too early. A lot of people want to go out in Amsterdam and we only slept for 2 hours because we had to leave. The day before it was really relaxed but the morning we had to leave we did not liked the way we were treated. Unfortunately I had to cancel my booking, so I'm unable to write a fair review when it comes to cleanliness, staff & atmosphere. However, I have stayed in this hostel several times in the past, and it has always been excellent, so... Anyway, that being said, the location is absolutely perfect! It's a safe area and the hostel is easy to reach from Central Station by tram. The museums, shops and other sights are either within walking distance or easily accessible by public transport. Lots of schools groups and families made for a pretty bad atmosphere for solo travelers. Not the hostels fault but still was harder to meet people even at the bars. Staff wasn't as helpful as they could have been. When I asked for reccomendations on food in the area they just said they have food at the hostel. Didn't feel like they really cared. Rooms were quite nice and had large enough lockers for me to store my bags no problem. Good location near the park. Erg duur voor een simpele kamer waar je zelf je bed moet opmaken enzo. Niet in verhouding. Past niet bij de stayokay mentaliteit. Jammer. Vreemd dat er prijs verschillen zitten in de locaties. Verder prima. Leuke ruimte waar je kan ontbijten. Mooie locatie.